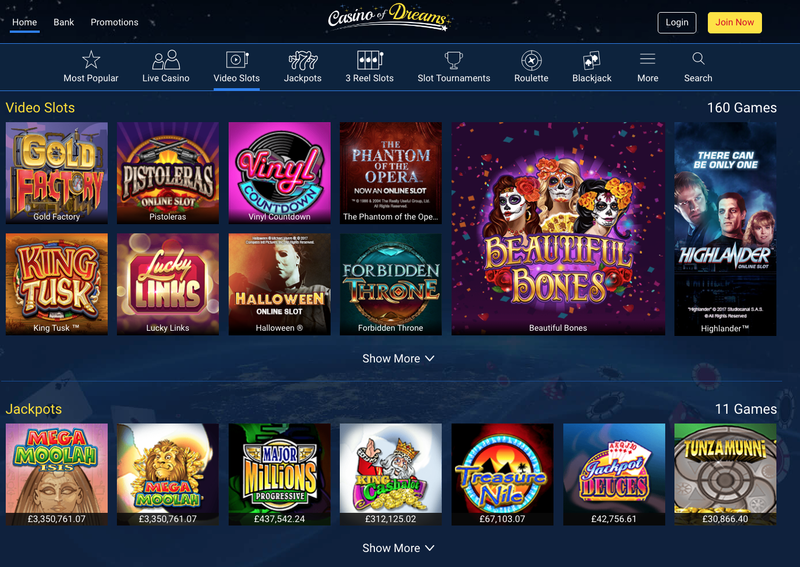 There are many optimistically aspirational titles for casino sites, but perhaps none fit this description better than Casino of Dreams. With the amount of choice that there is, it takes a fairly huge level of confidence to assume that what you are offering is the dream of the majority of players, and clearly Casino of Dreams have that. So what do they have to offer in the casino of your dreams? Perhaps unique gameplay options? Or promotions that leave all competitors in their dust? Well, no. What you get is arguably one of the most average online casino experiences around to the extent that it’s hard to believe it wasn’t intentional. But maybe that is what we all dream of truly? Maybe we all aspire to the middle? Or maybe there is more to Casino of Dreams than initially meets the eye? The main choice at Casino of Dreams is on slots, with over 130 video slots to choose from in total. Which is actually not that impressive when you put it up to the choice available in other places. This is not aided by the fact that many of the favourite slots of the majority of players are not present. However, there are TV and film themed video slots including Terminator 2, Bridesmaids, and Game of Thrones. A tad over 70 3-reel slots are also present. That being said, there are many different kinds of game at Casino of Dreams, so you are likely to find something you will enjoy. Bingo and keno are well represented, for example. For table game fans, there is a fair amount of choice too. Poker, Blackjack, roulette, and a handful of other table games are here to choose from. All in all, it is probably the variety of different styles of games that is most impressive about Casino of Dreams.